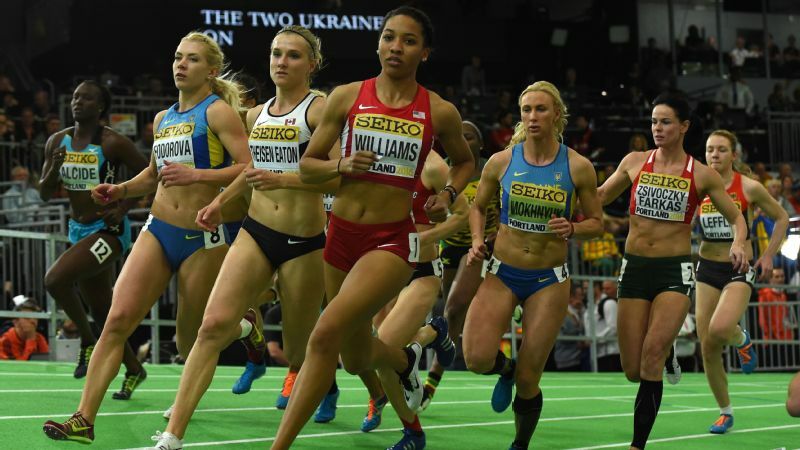 Kendell Williams, the three-time NCAA indoor pentathlon champion and 2014 NCAA heptathlon champion, has a chance to continue her success in the heptathlon at this week's NCAA track and field championship. 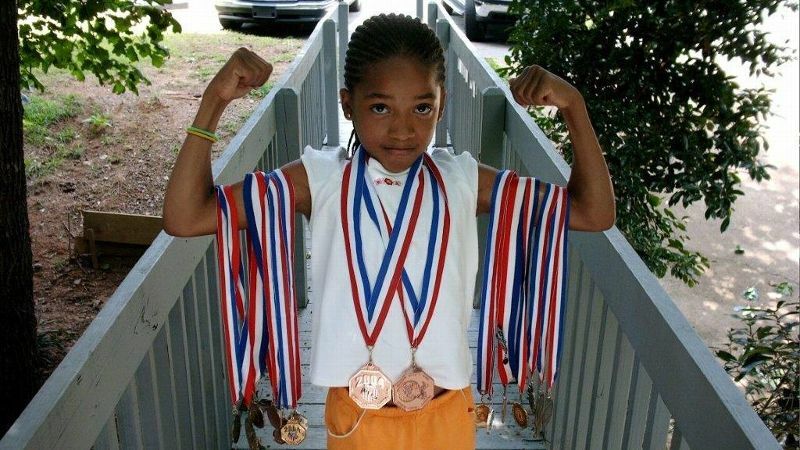 When Blane Williams first threw his kids, Devon and Kendell, into the pentathlon as middle schoolers, it served two primary purposes. First, it was a second chance for his two kids -- who were naturally skilled hurdlers -- to get a second flight of hurdles in during any given track meet. Yes, it meant Devon and Kendell participating in four more events on top of that just to run another 100 meter's worth of hurdles, but Blane thought that was completely worth it. Devon and Kendell Williams never had separate storage areas for their winnings. Together, they were the pride of the family. And second, Blane enjoyed that the pentathlon happened the day before the rest of the meet started, making it the most relaxing day at the track. The only people there were the multieventers and their parents. The starting guns weren't going off for the sprinters every other minute. The bathrooms were still clean. The officials were still nice. And there was a calm that overtook the track as the group of athletes moved from long jump to shot put to the hurdles and so on. Now, Blane laughs at that notion. This was once the calmest day of track meets? How far we have come. Now, 11 years later, there's only one way that Devon and Kendell -- a redshirt junior and junior at Georgia, respectively -- describe their father at collegiate track meets: The Pacer. Up and down, back and forth, along the curves and straightaways; checking the scores and entrants for males, then doing the same for females; then back up and down again. So goes the life of a father who has a son and daughter competing in the decathlon and heptathlon. In total, it's 18 events spaced over two days (at most meets) making for a very good workout not only for Devon and Kendall, but also for Blane as he paces. This week, the two will be competing at the NCAA track and field championships in Eugene, Oregon. For Kendell, it's a chance to continue her dominance. She's a three-time NCAA indoor pentathlon champion, the 2014 NCAA heptathlon champion and the 2015 NCAA runner-up in the pentathlon. For Devon, it's a chance to feel established in the sport he has always loved. His ŕesumé reads less like Kendell's and more like WebMD. From food poisoning and pulled hamstrings to hip flexors and sprained ankles, his career has been speckled with adversity since winning the 2005 national title in the pentathlon as a 11-year-old. It seemed as though every time Devon had qualified for a huge meet or was nearly qualified, injury would strike, putting him in the grandstands as Kendell raced to another four-gold-medal weekend. Other competitors and athletes would point out to Devon that while he was sidelined his little sister was dominating the national scene. Many times when Devon Williams was sidelined with injuries, his little sister, above, was dominating the national scene. She can stay healthy. She has never lost a 100-meter hurdle race. She wins everything. "I heard it all the time," Devon said. "But I never really listened to that." At home, Blane and wife, Terri, made sure that none of that noise was heard. All medals went on one of the hooks above the fireplace or into milk crates. All plaques went in plastic bins, which were then put into one of the kid's rooms or the loft. Kendell and Devon never had separate boxes or storage areas, all of the achievement was mixed together -- they were the pride of the family, not the individual. "We knew that sometimes it was hard on him, but he never really made it an issue we had to address," Blane said. "But Kendell has never been braggadocios about her success." That's a big part of why we wanted to come to the same school. We wanted to stay around for each other so we can push each other and try to be the best that we can be. Rather, much of Kendell's success can be attributed to Devon and the way he has fought back from each of his setbacks. 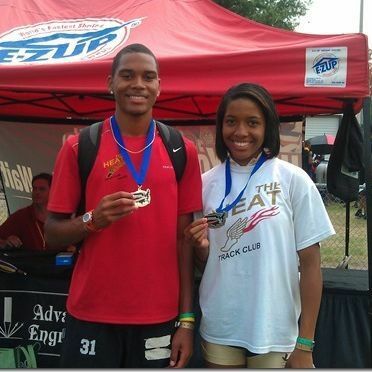 In 2011, Kendell and Devon had both won their multievent qualifier for the World Youth Championships in France (Kendell had also won her 100-meter hurdle qualifier). But Devon had failed to make the international standard, disqualifying him from competing at the championships. So he traveled with Blane and Kendell's best friend to France to watch Kendell compete in the multievent as well as the hurdles (she finished third in the world). In 2013, at the Pan American Junior Championships, Devon had to pull out of the meet early because of a fractured hip. He stayed and watched as Kendell took silver in the heptathlon. And last year, after Devon had finally qualified for the NCAA outdoor championships, he had to bow out after the first event of the decathlon when he suffered a pulled hamstring. "I can honestly say that my brother inspires me more than anyone I know," Kendell said. "I've seen firsthand everything he has had to go through up to this point -- the fact that he keeps getting back up after each thing that's thrown his way. He keeps getting back up, goes out to practice and trains for the next meet." And Kendell's success has helped push Devon. This week the two will finally have a chance to compete for national titles at the same time during their collegiate careers. It's a long way from when they did this event just to get another 100-meter hurdle race in, but both feel as if the other has helped them get from that point to where they are now. "That's a big part of why we wanted to come to the same school," Devon said. "We wanted to stay around for each other so we can push each other and try to be the best that we can be." With Devon feeling healthy and Kendell feeling strong, the Williams duo enters the NCAA championships seeded third and seventh, respectively, in their events. The only downside for Blane and Terri is the new NCAA format, which has spread the event out instead of running them concurrently. The men will be running the decathlon on Wednesday and Thursday, and the women will be running the heptathlon on Friday and Saturday. It's a longer weekend, but it also means four days of pacing around the track instead of two for Blane. "There are some logistical problems," Blane said. "But I guess we're the only ones on the planet that it creates a real scheduling problem for." No, it might not be quite as relaxing as it used to be, but they do know that at the end of the day, it's a pretty good problem to have.